How can I upload or change my on hold music? You can easily upload a file to play as your On Hold Music. Music on Hold plays the music while the callers is on hold. This feature allows the group administrator to upload the audio file for the Music on Hold. 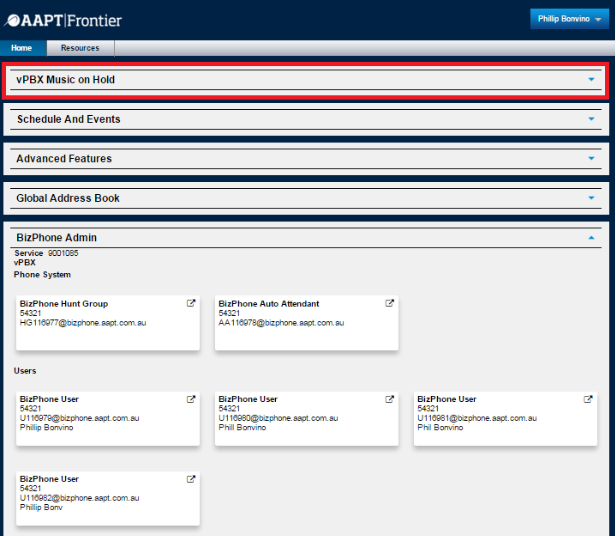 How to configure in Frontier:To access the Music on Hold, click on the icon next to “vPBX Music On Hold”. The Music On Hold page will appear (below). Select the Music on Hold settings. Profile Description Enable music during Call Hold Tick if you wish to play music for callers that are on hold. System Tick this option if you wish to use system defined Music on Hold. Custom Music File Tick this option if you wish to use a custom audio file for Music on Hold. Use existing audio file Tick this option if you have existing audio file and wish to use it. Upload new audio file Tick this option to upload a new audio file and choose file to upload. Click “Update” to save the Music on Hold settings that you have just configured. The maximum audio length is 10 minutes for the Music On Hold greeting.